1. In a bowl, mix the pork, salad onions, garlic, coriander stalks and ½ tbsp honey; season. Shape into 8 patties; set aside. 2. In a pan, bring the fish sauce, vinegar, ginger, chilli, lemon grass, lime zest and juice, remaining 1½ tbsp honey and 100ml water to the boil; simmer for 3-4 minutes. Set aside in a serving bowl. Cook the noodles according to pack instructions and set aside. 3. Brush the patties with a little oil, then griddle over a high heat for 10 minutes, turning regularly. 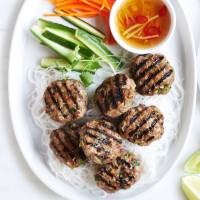 Arrange the lettuce, carrot, cucumber, herbs, noodles and dipping sauce on a plate with the cooked patties. Low in calories and fat, lettuce is also rich in folic acid, which is good for the immune system. Try using leaves to wrap fillings as an alternative to bread.